With OverDrive, you can borrow up to 12 titles from the Public Library at a time. Get started with your library card number to read on your desktop or with the Libby app on your device. OverDrive works with many devices. These support pages are designed to give you a snapshot of how popular devices can be used with digital titles from OverDrive-powered library, school, and retail websites. Select the above link, pick a device or platform from the available menu to access its profile. Each profile lists recommended software and/or apps, compatible formats, and links to articles and videos containing step-by-step instructions to help you get started. Tutorial videos for iOs devices, including the iPhone, iPad, and iPod touch. Tutorial videos for MP3 players from brands like Sony, SanDisk and Creative. If you're looking to borrow free audiobooks from the Public Library, you've come to the right place. This resource page from OverDrive will walk you through all of your questions on how to access and use audiobooks. 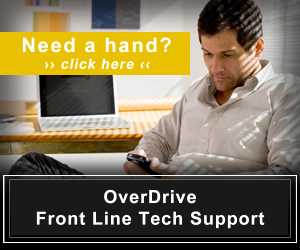 Please contact the OverDrive Front Line Tech Support for direct support or technical assistance. The OverDrive Support page has solutions for many common issues and questions. Any known issues affecting OverDrive services will be tracked here. Please note that service issues may vary from user to user depending on the impact.